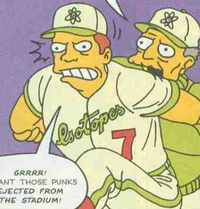 Willy Dipkin is a second baser for Springfield Isotopes. Bart and Milhouse planed to watch a game between the Springfield Isotopes and the Salem Boulevardiers. The day before the game Willy committed a record of 12 errors, causing the Isotopes to lose 14-2. When Bart and Milhouse tried to get his autograph Bill McCloskey tricked them into calling Willy Dipkin a "fishface". The prank lead to Bart and Milhouse getting ejected from the game. As revenge, Bart quickly wrotesomething on Dipkin's bat and him and Milhouse left while Dipkin was getting his picture taken for a baseball card. When the new baseball cards had arrived it was revealed that Bart wrote "fishface" on his bat. As a result, the cards got pulled off the market and only a few got out, making them rare, one of which Bart got. Modified on February 9, 2013, at 11:10.